Mae Tallick from Novi Stars is also known among friends as Miz Bot. This pink and purple girl is made entirely of iron, and therefore she does not wear a lot of clothes. Mae loves the music, and especially to perform on concerts as a DJ. To do this, she needs cool costumes. Create several beautiful dresses for a concert. How to play: Click the buttons on the left and on the right from the girl to change her clothes. Create a unique image. 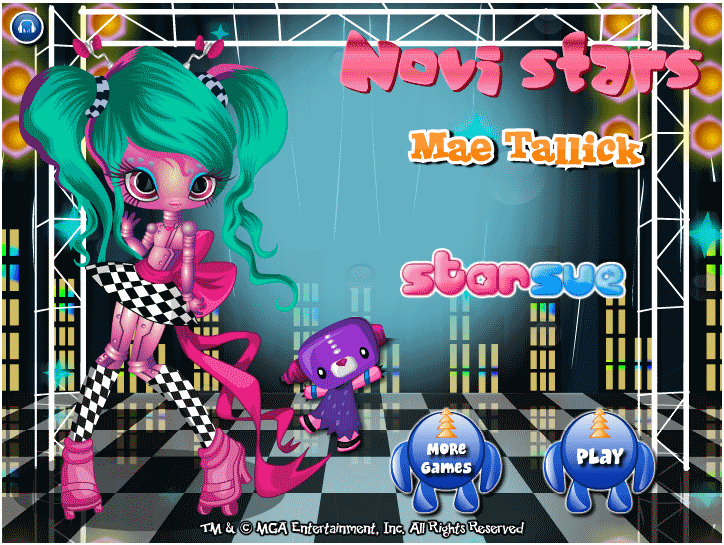 Mae Tallick dress up game. Blue hair and red dress. Pink haircut and yellow dress.